The Echinocactus grusonii Hildm. (1891) is native to Mexico (states of Queretaro, San Luis Potosi and Zacatecas), where it is an endangered species. The name of the genus is the combination of the Greek word “echinos” = hedgehog and “cactus” = with reference to its globose shape. The species is honoured to the German industrialist and collector, Herman Jacques Gruson (1821-1895). 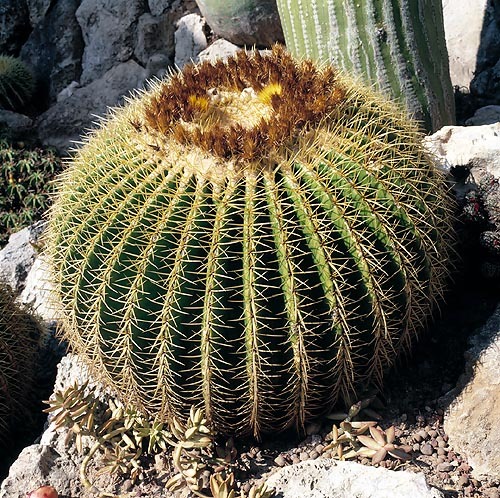 Common names: barrel cactus”, “gold barrel cactus”, “gold-ball cactus”, “mother-in-law’s armchair”, “mother-in-law chair’s”, “mother-in-law’s cushion”, “mother in laws pillow” “mother-in-law’s seat” (English); “cactus oursin”, “coussin de belle-mère”, “siège de belle mère” (French); “cuscino della suocera” (Italian); “assento de sogra”, “bola de ouro”, “cacto barril dourado”, “cacto-bola”, “cadeira-de-sogra”, “poltrona-de-sogra” (Portuguese): “asiento de suegra”, “barril de oro”, “biznaga dorada”, “biznaga gigante”, “bola de oro”, “cactus erizo”, “cojín de suegra” (Spanish); “Goldkugelkaktus”, “Schwiegermuttersitz”, “Schwiegermutterstuhl” (German). Usually solitary plant, globose when young, tending to become almost cylindrical with the time. It is 0,2-1,5 m tall with a diameter of 0,3-1 m with pale green epidermis. During the first stage of growth it has conical tubercles which, time passing, melt to form the typical, 20 to 37, marked, straight-lined and approached ribs. 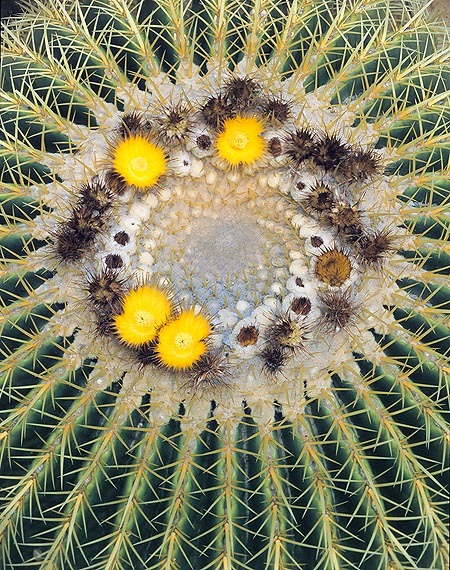 On the ribs are areolas spaced 1 to 2 cm with 8-10 radial thorns, long up to 3 cm, and 3-4 robust central ones, straight and erect, long up to 5 cm. The thorns are golden yellow and tend to darken with the age. The apical areolas have a golden yellow down getting thicker towards the centre. There is a thorn-less form as well as another one with white thorns. The plant begins to bloom, under the best cultivation conditions, not before the 10 years of age. But there are cases, which are not rare, of specimens taking much more years to reach the maturity. The yellow flowers, placed in circle close to the apex. They are campanulate, 4-6 cm long and with a diameter of 3-5 cm, last three days and rarely are completely open. The fruits are globose, 1,5-2 cm long, greenish, covered by a white down and contain many glossy dark brown seeds. It usually and easily reproduces by seed, which takes about a week for germinating. Plant of great ornamental and landscape value, both for its look and for the facility of cultivation. It has been and still is, even if somewhat less, one of the most cultivated cacti by the collectors and most utilized when realizing “desert” gardens. It is to be cultivated in full sun, or however at the maximum possible luminosity, on particularly draining soils, as it is rather sensitive to radical rottenness due to stagnating humidity. The composts can be formed for about the 50% by common manure garden earth and for the remaining part, by sand (agri-perlite) and crushed stones without dust. It is rather resistant to low temperatures. Adult specimens can bear, in dry soil and for a short time, temperatures as low as -7°C. But it is very sensitive to the excess of ambient humidity, which, in winter, can cause serious rottenness, in particular at the apex, this is, without any doubt, the most vulnerable part of the plant. 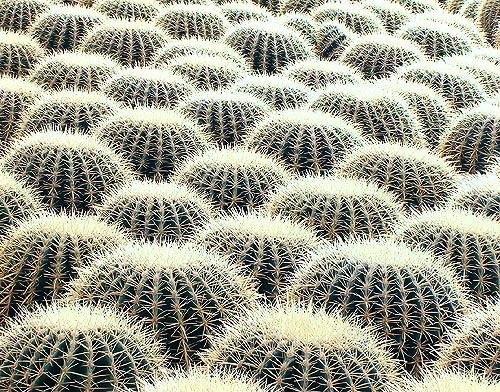 Where the climate does not allow its cultivation in open air, the Echinocactus grusonii is to be cultivated in pot under the same conditions stated before. In summer, during the vegetative time, it is to be regularly irrigated, but the soil has to dry up completely between the different waterings. In winter it is to be kept dry, in sheltered locations, and at temperatures not lower than the +12 °C. The plant is unluckily inscribed in the appendix II of the CITES (plant for which the trade is ruled at international level). → To appreciate the biodiversity within the family CACTACEAE and find other species, please click here.